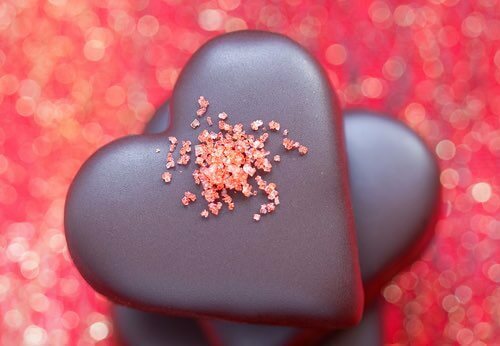 You will love these old fashioned Valentine chocolate recipes. 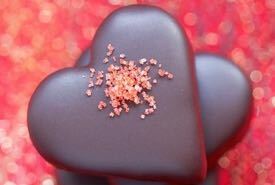 Don't the chocolate fudge hearts look delicious in the photo above? Why not make some and give them to your loved ones? Both the chocolate fudge hearts and Mrs. Salzbacher's chocolate hearts taste especially good. Homemade chocolates are the perfect gift for that special someone. After all, everybody loves the gift of candy! Boil the sugar, milk, and water to 236°F, or to the "soft ball" degree; stir gently every few minutes; add the butter and let boil up vigorously, then remove from the fire and add the chocolate; let stand undisturbed until cool, then add the vanilla and beat the candy until it thickens and begins to sugar. 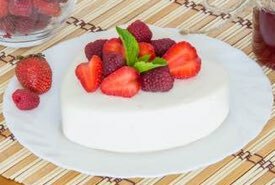 Pour into a pan lined with paper to stand until cooled somewhat; turn from the mold and cut with a tiny heart-shaped cookie cutter or cut into symmetrical shapes with a French cutter or a sharp edged tube. The suggested oven temperature for this Valentine chocolate recipe is not exact, it being an old fashioned candy recipe, so you may need to watch very closely and experiment a little for the chocolates to turn out just right. Melt, by standing over hot water, three ounces of unsweetened chocolate; add a pound of sifted powdered confectioners' sugar and mix thoroughly; work to a stiff yet pliable paste with the unbeaten whites of three eggs (or less), adding vanilla to flavor. If the paste seems too soft, add more sugar. Break paste off in small pieces and roll out about one-fourth of an inch thick, sprinkling the board and paste with granulated sugar instead of flour. Cut with a tiny heart-shaped cookie cutter (any other small cookie cutter will do), and place on pans oiled just enough to prevent sticking. Bake in a very moderate oven, watching closely until done. When done, they will feel firm to the touch, a solid crust having formed over the top. They should be very light, and will loosen easily from the pan after being allowed to stand a moment to cool. 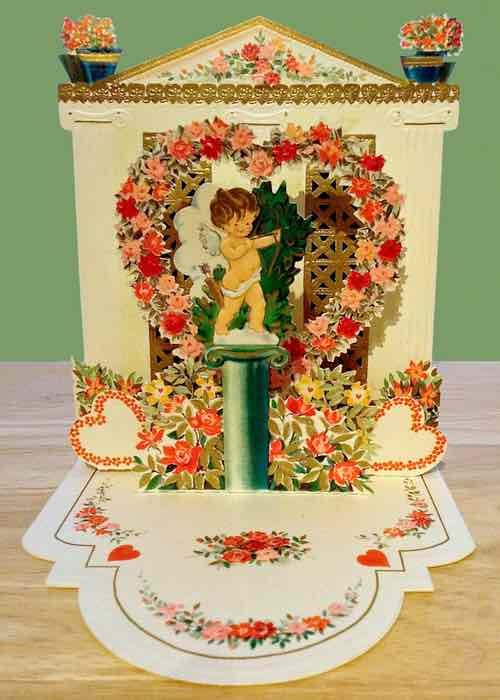 The vintage pop-up Valentine pictured above was given to my mother by my father sometime in the 1930s, during the height of the Great Depression. It must have cost Dad a pretty penny back then, and Mom always treasured it.